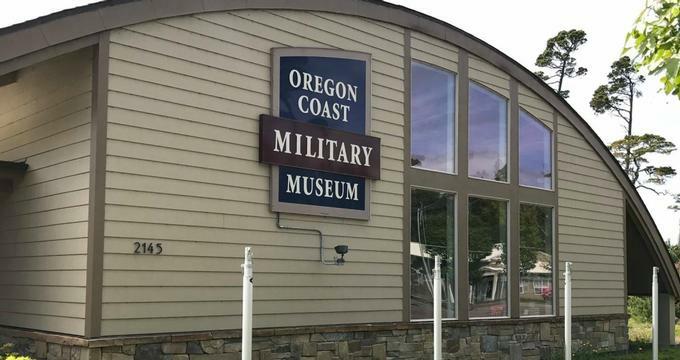 Located in Florence, Oregon, the Oregon Coast Military Museum showcases exhibits honoring regional military veterans and service members in international conflicts throughout the 20th and 21st centuries. The city of Florence, Oregon is heavily populated with American military veterans, with more than 21% of the area’s residents having served in at least one international military conflict in the 20th and 21st centuries. The region is also a popular residence for retirees living along the Oregon Coast and residents with ties to American military service branches. In 2008, the Oregon Coast Military Museum nonprofit organization was organized by a group of area citizens for the purposes of creating a museum facility honoring American military service members, with a particular focus on the service of Florence and Oregon Coast residents. Following seven years of fundraising and museum construction efforts, the Oregon Coast Military Museum officially opened to the public in July of 2015. Today, the Oregon Coast Military Museum is operated as an Oregon domestic nonprofit corporation, overseen by a volunteer board of directors. More than 3,000 square feet of exhibit space is showcased at the museum’s permanent facility in Florence, which is located adjacent to the Florence Municipal Airport campus. The museum is open to the public Thursdays, Fridays, and Saturdays during the late morning and early afternoon hours, with admission rates for adults, children, and museum members. As a nonprofit museum facility, the OCMM is dedicated to educating the Oregon Coast community about the service and sacrifices of local military members and honoring veterans from all eras of military heritage, with a focus on 20th and 21st-century international conflicts. A variety of exhibits and memorabilia are showcased at the 3,000-square-foot museum facility, including personal artifacts such as uniforms and medals belonging to Oregon Coast military veterans. Other military memorabilia on display includes weapons such as guns and bayonets and collections of American and military flags. A variety of military vehicles are displayed at the facility, including vintage Jeeps. Exhibit areas within the museum provide a chronological retrospective of international conflicts, including World Wars I and II, the Korean War, the Vietnam War, Operation Desert Storm, and the Global War on Terrorism. The museum’s centerpiece is its collection of life-sized dioramas and artistic panels created by local artists depicting scenes from 20th and 21st-century international conflicts, including depictions of soldiers in trenches during World War I and the Pacific and European Theaters of World War II. M.A.S.H. activity during the Korean War is also depicted, as is a jungle scene from the Vietnam War and a United States convoy traveling through an Iraqi village during Operation Desert Storm. Mannequins are displayed throughout the dioramas depicting American soldiers, and written information detailing the background and history of each conflict is provided with each diorama area. A theater at the museum presents periodic showings of military-themed documentaries, and a lending library offers volumes related to 20th and 21st-century international conflicts and the branches of the American military. Children’s exhibit areas include a touch table and a free play area with snap-together model toys. A gift shop at the museum offers military-themed books, souvenirs, and apparel. In addition to standard visitor admission, the Oregon Coast Military Museum offers guided tour experiences for small groups and organizations, including curriculum-incorporated field trips for elementary, secondary, and collegiate school groups. Tour reservations must be scheduled prior to tour date by contacting the museum’s chief of staff via phone or email. A number of public special event programs are held at the museum throughout the year, including a Military Heritage Day event in April, a Southern Oregon Veterans Benefit event, a Wings and Wheels Fly-In and Car Show, and an annual Walkthrough Winter Wonderland and Festival of Trees event during the winter holiday months. Military ceremonies are held periodically at the museum, including United States Coast Guard ceremonies. The museum is also available for private event rentals, including veterans events and meetings. The city of Florence, Oregon is located on the central Oregon Coast near Highway 101 and offers a variety of scenic and tourist attractions, including the Oregon Dunes National Recreation Area, which offers hiking and outdoor recreation activities. The Cape Perpetua Scenic Area, located within the Siuslaw National Forest, is located nearby, along with the restored Heceta Head Lighthouse and the Sea Lion Caves attraction, which showcases local populations of Steller sea lions. The city’s Old Town historic downtown district offers a variety of attractions, including the Siuslaw Pioneer Museum, the River Gallery, and a number of traditional riverfront restaurants. A park, marina, and RV campground are located along the city’s waterfront, which also offers fishing, dune buggy riding, crabbing, and clamming experiences.